Welcome to Sara’s Campground, offering camping along the shores of beautiful Lake Erie! 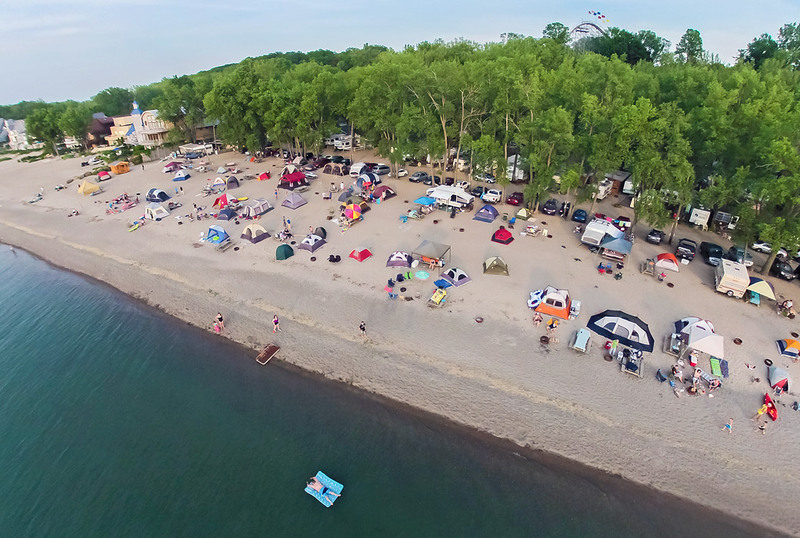 Pitch your tent or park your camper on one of over 100 campsites nestled along both the bayside and lakeside beaches of the lake. 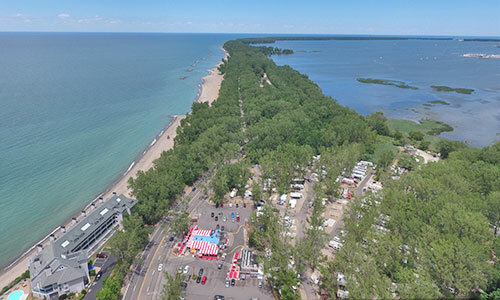 Sara’s Campground is located directly between Presque Isle State Park, with over 12 miles of public beaches, bike paths and nature trails, and Waldameer Amusement Park and Water World. “The Beachfront Attraction In Pennsylvania You’ll Want To Visit Over And Over Again”! 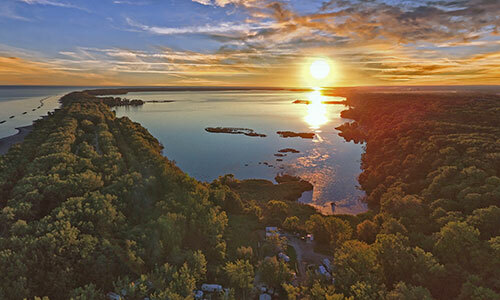 Newsflash: Presque Isle State Park rated “Best Freshwater Beach” by USA TODAY! Click here for Special 2018 Coupon Offers! Prices include 2 adults and 4 children. Pets are permitted (on a leash) within the wooded areas of the campground. • Reservations are not accepted for any beach camping! • Beach camping is available on a first come, first served basis. • Please call our office prior to leaving to check anticipated availability. • Reservations are available on the bay side for trailers, motorhomes, and pop-ups. • We offer full service sites (water, 30/50 electric, sewer, cable, and internet). • We require a 5 NIGHT MINIMUM STAY for reservations from mid June through mid September. • All reservations must be paid in full at the time the reservation is accepted (24 hour cancellation policy). We accept Visa or MasterCard. • If you do not meet the 5 night reservation requirement, you can check with the office for availability but availability is limited. • Bay side tent camping is first come, first served. Please call our office prior to leaving to check anticipated availability. • ALL TENT CAMPING IS AT A FIRST COME, FIRST SERVED BASIS WHETHER YOU STAY ON THE LAKE SIDE (BEACH) OR BAY SIDE (WOODED AREA). • Because we don’t take reservations, there is no minimum stay required. • We do not have cabins. • We do not accept online reservations. • When you stay 6 nights you get the 7th night FREE! Movies will be moved to the craft tent in inclement weather. Please bring a chair to all activities. The cost for crafts ranges from $1.00 and up. All Bingo (Bayside) proceeds go to buy Christmas gifts for the children during the Santa visit in July. There are three prizes for permanent sites and three for non-permanent sites, plus one tree and one scarecrow. Please volunteer to help at all activies. Your help will be much appreciated. As always, help is needed to load hayrides and to haunt. Please DO NOT let children ride bikes or run at haywagons, since the drivers cannot see or hear them. © Sara’s Campground. All rights reserved.